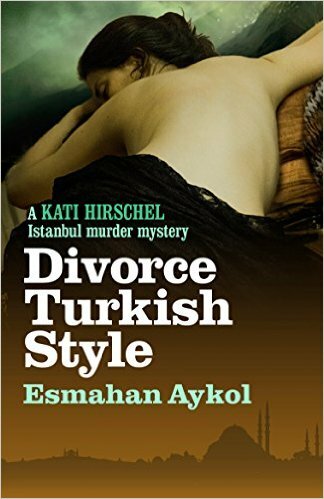 Esmahan Aykol's Istanbul novels featuring Kati Hirschel, crime fiction bookseller and amateur detective, are a bit unconventional. Kati occasionally speaks directly to the reader, and her narrative is full of details about Istanbul and its citizens, of all classes (that detail is one of the most striking things about the series), but the crimes and even the investigation can be a bit difficult for the reader to pin down. I the newest, Divorce Turkish Style, there's a dead woman who was perhaps (and perhaps not) murdered; there's a Thracian separatist group and rapacious industrialists at odds over the pollution of a Turkish region; and there are several very complicated families (not least the unofficial "family" of Kati, including her roommate, the Spanish Fofo and her cop friend Batuhan). Kati insinuates herself into the dead woman's family as well as into the lives of other people associated, sometimes tangentially, with the victim (who was an environmental activist), frequently in cafes around the city. The puzzle of the crime doesn't develop slowly toward a resolution: the situation remains totally fuzzy until it is clarified rapidly toward the end. This structure might be frustrating or boring in another writer's hands, but Aykol brings it off effectively through her attention to Kati's voice. Kati is never totally serious, always uses crime-fiction references in a way that is only half-serious in her pursuit of the truth, and always has her personal life on the front burner (she's currently without a lover, but keeping her options open, for example) and always in pursuit of the particular pleasures that keep her in Turkey rather than in her ethnic homeland, Germany. The series isn't exactly cozy nor is it noir. Kati is always front and center, and a reader will know immediately whether he or she wants to spend a few hundred pages with her (as I have done with each installment). And the covers, by the way, are beautifully designed.